GWANGJU -- The name of the Seoul-based artist duo Kimchi and Chips pretty much tells where the artists are from. Korean-British artist duo Mimi Son and Elliot Woods formed an art studio in 2009, adopting the quirky name. 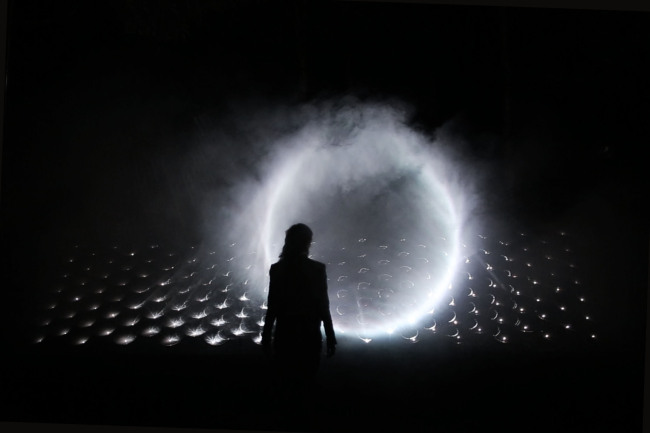 Since then, the two have been creating installations that challenge people’s perception of light and space and presenting them at museums and galleries throughout the world. One of the most well-known works is the first edition of the “Light Barrier” series in which the artists materialized three-dimensional shapes from light by crisscrossing millions of calibrated beams using projections and concave mirrors, while intensifying the effect with grandiose sound. That work left such a strong impression that two Korean art institutions commissioned them to create two additional versions of the series. 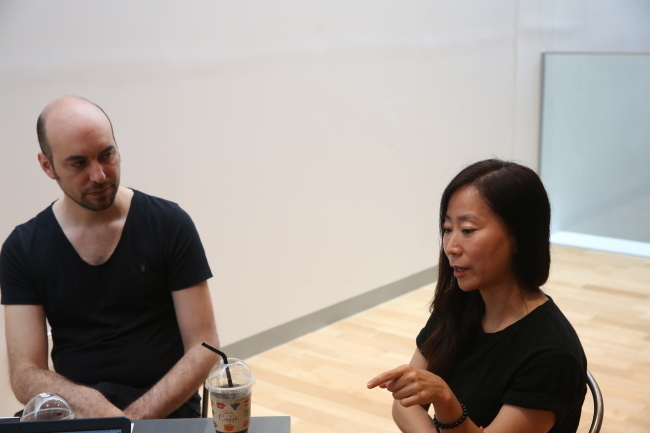 Son and Woods are presenting the third edition of “Light Barrier” at the Asia Culture Center in Gwangju from June 24 to Oct. 23. 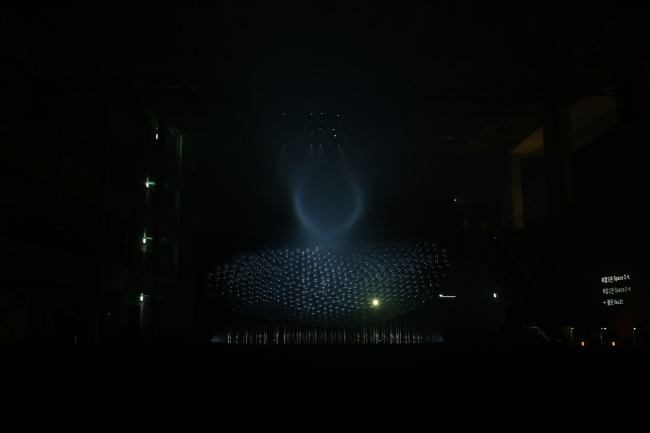 The second edition, “483 Lines” of vertical strings and light performances on each thread, was commissioned by the Jeju Museum of Art and exhibited at the museum in 2014. “When we have a project like ‘Light Barrier,’ many people want to commission it because they now know what it will be like. But the first time we made it, we didn’t know what it was going to look like,” said Woods at an interview at the ACC in Gwangju, on June 23, ahead of the official unveiling of the installation. The artists, part of the ACC’s residence program, have been working at the creation and production center of the new cultural institution, the ambitious workshop facility the institution envisions as the core of its creativity. The concept of materializing light and space was also unexplored territory for the artists. For audiences, it’s a concept that is hard to understand immediately. “All our projects don’t have surfaces. They have a lot of elements played out, which makes it very much difficult to imagine the ways you understand buildings and paintings,” Woods explained. But the synergy of Woods’ background in physics and Son’s experience in interactive design enabled the unfamiliar concept to be endowed with physical forms and to be effectively delivered to audiences. “When we started working together, we didn’t have any specific goal. We didn’t know what we would become. We liked to experiment with each other’s world,” Son said. Woods studied physics and Son studied designing interfaces or systems that assist users with special needs, such as autistic children and their parents, in everyday life. That was when the highly visual technology met human touch, the artists said. The two members didn’t think of themselves as artists in the early days of their collaboration. But when their visual displays were exhibited in galleries and museums, people labeled them artists and the two started to consider themselves such. “This is not within the realm of how people ordinarily describe artwork, but it is definitely artwork,” said Woods. Their work processes don’t start from sketching on a piece of paper. They start with having an abstract feeling or image that they want to deliver to audiences. “We begin to create without knowing what the final work would look like. We discover a lot of things during the work process,” Son explained. In the 2011 “Lit Tree,” the artist duo imagined a three-way interaction among light, tree and the audience. They brought in a small bamboo tree and used it as a canvas on which a video projection creates volumetric light patterns using its own leaves as voxels. “Trees react to light. You can see at the end of the exhibition, the tree looks different from when they first came in,” said Woods. The third edition of “Light Barrier,” currently on view at the ACC, creates ghost-like geometrical shapes above a shell-like structure that consists of 630 concave mirrors. Light beams shoot from every angle and the reflections from the mirrors create a mesmerizing view of what seems like mystical underwater rays of sunlight. “The Light Barrier helps audiences redefine what their limits of realities are. They will see something which challenges what’s possible and impossible in their mind,” said Woods.